Next stop for the UN envoy who royally screwed up in Burma? Sudan. It was just the first in a series of diplomatic blunders that would sully Gambari’s tenure as the UN’s envoy in Burma. Widely viewed as a pawn in the junta’s game of repeatedly fooling the international community about its willingness to change, he earned the nickname “Gullible Gambari.” “He had all these meetings and nothing to show for it,” says David Mathieson, a Burma researcher for Human Rights Watch. When the UN announced in December that it was reassigning Gambari to be its top envoy in Sudan, effective January 1, many Burma watchers breathed a sigh of relief. “Gambari--who liked to tell critics who faulted him for a lack of results that his mission was ‘a process, not an event’--often seemed a hapless bystander whenever anything actually happened in Burma,” The Irrawaddy, a Thailand-based newspaper established by Burmese citizens in exile, said in a scathing editorial. But some Darfur activists are now worried that Gambari might repeat his mistakes in Sudan. “My main concern is that his focus would be on accommodation of the regime, and that would leave the perpetuation of an unacceptable and unstable status quo,” says Jerry Fowler, president of the Save Darfur Coalition. Gambari was already a UN veteran when he was assigned to Burma. His résumé included a stint as Nigeria’s ambassador to the UN, missions in South Africa and Angola, and an appointment as the secretary general's Special Adviser on Africa. He took over the Burma mission with his now-infamous inaugural trip as under-secretary general in 2006 and was officially appointed envoy the following May. That same year, he also became the Special Adviser on the International Compact with Iraq and Other Political Issues. Gambari visited Burma seven more times after his initial embarrassment. Each trip followed the same benign pattern. “[The regime] organized his schedule, decided who he saw, planned his dinners,” says Farmaner of Campaign for Burma UK. (Gambari admitted in a 2007 interview that the junta kept him “holed up.”) His agenda focused narrowly on the relationship between the junta and Suu Kyi's political party, the National League for Democracy (NLD). He would ask the regime’s leaders to release Suu Kyi--who was never allowed to become prime minister after her party won the 1990 general election in a landslide--and other political prisoners; to engage in talks with the NLD; and to expedite democratic reforms. Sometimes Than Shwe would meet with Gambari; on other trips, only lower-level regime members would speak with him. And he was usually granted brief audiences with Suu Kyi. After each trip, Gambari would say that his mission, while slow-moving, was progressing--even as the regime kept up its business as usual. “There wasn’t a level of realism and honesty,” says Jennifer Quigley of the U.S. Campaign for Burma. In 2007, when the NLD was barred from participating in the writing of a new constitution, Gambari still praised the process. “The international community would have preferred a more inclusive process, but nonetheless it’s an important event,” he told Agence France-Presse. “We hope that that will lead to even more progress.” (The constitution, finalized in May 2008, legitimized the military’s rule and barred Suu Kyi from holding office.) After his trip that September, which he took in response to the junta’s brutal crackdown on protests led by students and Buddhist monks, Gambari told reporters that he was optimistic about Burma’s future. “The fact is that I’ve been allowed in three times now,” he told NPR that October. “So that gives me some encouragement that perhaps, perhaps, you know, there might be an opening there.” And, when Cyclone Nargis slammed Burma in May 2008 and the regime blocked international aid, Gambari was nowhere to be seen. Gambari would visit Burma only two more times. After a February 2009 trip, the regime released about two dozen political prisoners, and Gambari declared that his “message [was] getting through.” (The Karen National Union issued a statement at the time that criticized the envoy for “once again … visit[ing] Burma without also meeting with genuine representatives of Burma’s ethnic nationalities.”) In May, however, the regime pulled another about-face, putting Suu Kyi on trial for allegedly violating the terms of her house arrest. When she was convicted in August, Gambari told Voice of America that he was “extremely disappointed”--but, as always, he was optimistic about the little things. “The conditions of her detention, house arrest, have been eased somewhat,” he said. 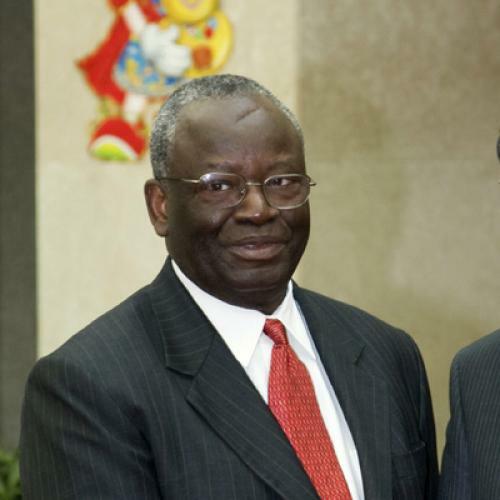 When news broke that Gambari was being sent to Sudan, Burma activists declared him a failure. “He has no sort of success that he can show,” says Quigley of the U.S. Campaign for Burma. “Things have gone from bad to worse during his tenure.” (Although some human rights groups were pushing for his removal, Gambari’s transfer may have had more to do with African politics; some observers speculate that Nigeria, which reportedly feels its large troop presence in Sudan is underappreciated, was lobbying to have one of its own appointed envoy.) According to the Campaign for Burma UK, in the first two years of Gambari's mission, the number of political prisoners in Burma almost doubled and more than 130,000 people were forced from their homes in an "ethnic cleansing campaign." And he was never able to start talks between the regime and the NLD. Gambari’s diplomatic career isn’t finished, and human rights activists are waiting to see if he’ll take a tough approach in Sudan, as the country prepares for national elections and a referendum on southern secession. “Everyone is hoping that he’ll surprise and be effective,” says Fowler of Save Darfur. After his work in Burma, don’t count on it. Seyward Darby is the assistant managing editor of The New Republic.